I have to confess. When it comes to sweet treats my weakness is called meringues. I have this weakness since childhood. I have struggled then so many times to make them right and all of the times I was ending up with some sticky, brown on the surface meringues. They were tasty but they were all the time sticking to my teeth. At a certain moment I simply gave up. Then, one day I manage to make them well. Here is the recipe. Since then, I tried the exact same recipe many times and I simply couldn't get them the same. So I gave up again. Few days ago, a friend of mine posted some incredible meringues. I couldn't resist and asked him for some tips and tricks. He kindly exposed all meringue secrets so I decided to give them another try. They turned out to be PERFECT from the first trial. And I know now what was my mistake before. By all means, if you love meringue.... this is THE recipe I have looking for more than 30 years. Thank you Rick for sharing the secrets of this recipe with me. 408g sugar (so, double the quantity of egg whites). Beat the egg whites with a standing mixer until it foams. Add slowly the sugar and continue to beat the eggs for 15-20 minutes or until the foam gets very white, glossy and there is no bubble seen. The beaten egg white should look like a thick cream and it should form peaks. 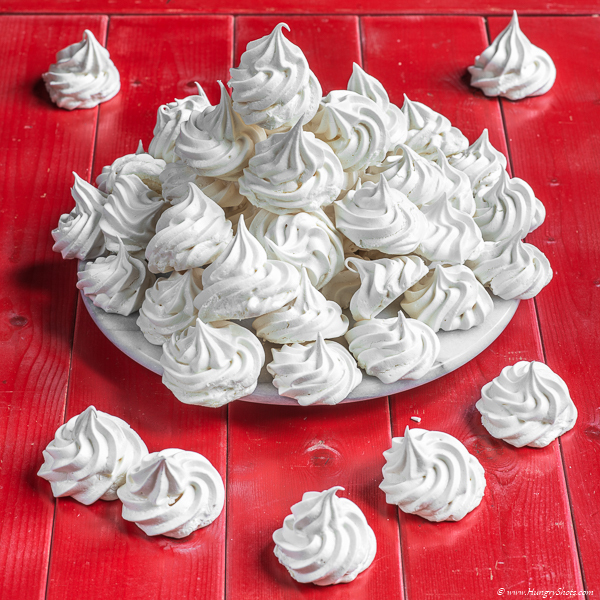 Put the meringues on silicone sheets in 2 trays using either a spoon or a decorating bag. Bake in the preheated oven for 90 minutes at 100ºC. Keep the oven door closed for the next 2 hours for the meringues to dry inside as well. Transfer them in airtight containers to avoid humidity to get them moist. What do you do with the sugar? Mizri, you are totally right, I forgot to mention this aspect. I just corrected this in the post. The sugar should be added slowly when the egg whites started to foam. Thanks for letting me know!